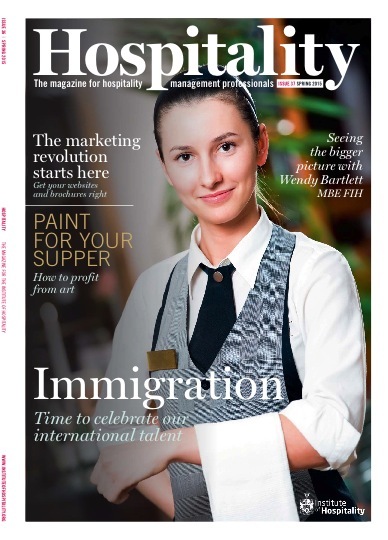 The article was originally published in ‘Hospitality‘, the members magazine of the Institute of Hospitality. 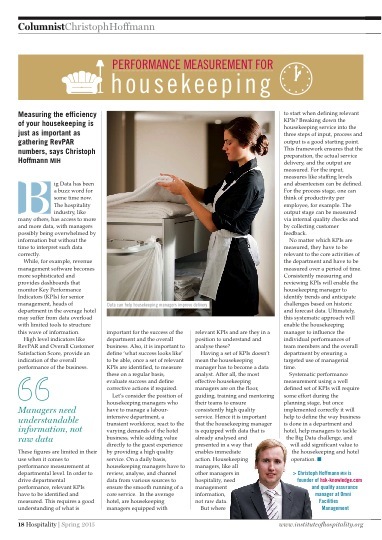 Measuring the efficiency of your housekeeping is just as important as gathering RevPAR numbers. Big Data has been a buzz word for some time now. The hospitality industry, like many others, has access to more and more data, with managers possibly being overwhelmed by information but without the time to interpret such data correctly. While, for example, revenue management software becomes more sophisticated and provides dashboards that monitor Key Performance Indicators (KPIs) for senior management, heads of department in the average hotel may suffer from data overload with limited tools to structure this wave of information. High level indicators like RevPAR and Overall Customer Satisfaction Score, provide an indication of the overall performance of the business. These figures are limited in their use when it comes to performance measurement at departmental level. In order to drive departmental performance, relevant KPIs have to be identified and measured. This requires a good understanding of what is important for the success of the department and the overall business. Also, it is important to define ‘what success looks like’ to be able, once a set of relevant KPIs are identified, to measure these on a regular basis, evaluate success and define corrective actions if required. Let’s consider the position of housekeeping managers who have to manage a labourintensive department, a transient workforce, react to the varying demands of the hotel business, while adding value directly to the guest experience by providing a high quality service. On a daily basis, housekeeping managers have to review, analyse, and channel data from various sources to ensure the smooth running of a core service. In the average hotel, are housekeeping managers equipped with relevant KPIs and are they in a position to understand and analyse these? Having a set of KPIs doesn’t mean the housekeeping manager has to become a data analyst. After all, the most effective housekeeping managers are on the floor, guiding, training and mentoring their teams to ensure consistently high quality service. Hence it is important that the housekeeping manager is equipped with data that is already analysed and presented in a way that enables immediate action. Housekeeping managers, like all other managers in hospitality, need management information, not raw data. But where to start when defining relevant KPIs? Breaking down the housekeeping service into the three steps of input, process and output is a good starting point. This framework ensures that the preparation, the actual service delivery, and the output are measured. For the input, measures like staffing levels and absenteeism can be defined. For the process stage, one can think of productivity per employee, for example. The output stage can be measured via internal quality checks and by collecting customer feedback. No matter which KPIs are measured, they have to be relevant to the core activities of the department and have to be measured over a period of time. Consistently measuring and reviewing KPIs will enable the housekeeping manager to identify trends and anticipate challenges based on historic and forecast data. Ultimately, this systematic approach will enable the housekeeping manager to influence the individual performances of team members and the overall department by ensuring a targeted use of managerial time. Systematic performance measurement using a well defined set of KPIs will require some effort during the planning stage, but once implemented correctly it will help to define the way business is done in a department and hotel, help managers to tackle the Big Data challenge, and will add significant value to the housekeeping and hotel operation.